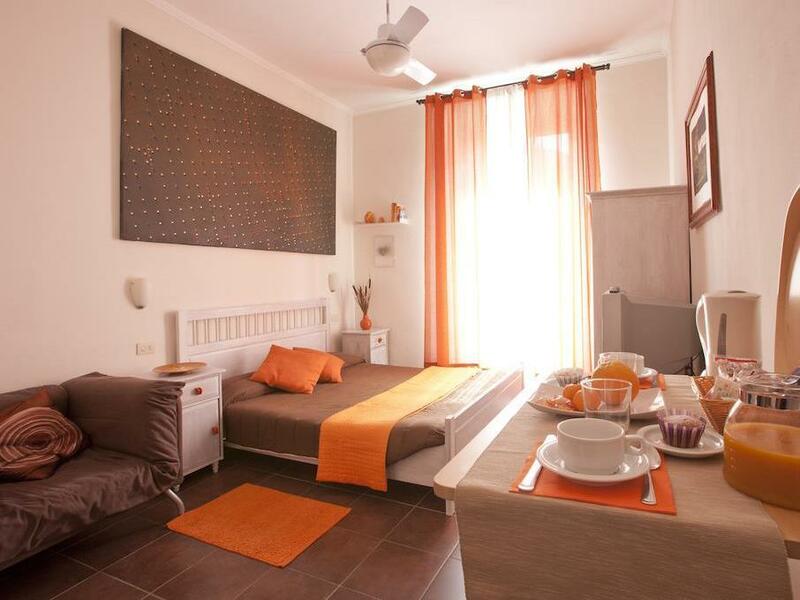 ﻿ Domus Victoria Guest House Rome. JIMAT di Agoda.com! Ada soalan mengenai Domus Victoria Guest House? Hanya 2 minit berjalan kaki dari Stesen Metro Vittorio Emanuele, Domus Victoria menawarkan bilik-bilik dengan TV dan WiFi percuma. Colosseum Rome berada 10 minit berjalan kaki jauhnya. Bilik-bilik gaya klasik di Victoria dilengkapi dengan kipas, cerek elektrik dan lantai jubin. Bilik mandi peribadi menyediakan alat pengering rambut serta peralatan mandian percuma. Sarapan gaya Itali dihidangkan setiap hari. Kawasan ini mempunyai pelbagai kedai-kedai etnik dan restoran yang menyajikan masakan Asia dan Timur Selatan. Stesen Kereta Api Termini berjarak 10 minit berjalan kaki. Pihak hotel tidak menyediakan pendaftaran 24 jam. Sehubungan itu, tetamu diminta memaklumkan pihak penginapan lebih awal jangkaan waktu ketibaan mereka. Sila nyatakan dalam kotak Permintaan Khas semasa membuat tempahan. Sarapan dihidangkan di bar di luar penginapan ini. Sila beritahu Domus Victoria Guest House terlebih dahulu mengenai anggaran waktu ketibaan anda. Anda boleh melakukan ini dengan menggunakan kotak Permintaan Khas semasa membuat tempahan. Anda juga boleh menghubungi tempat penginapan dengan maklumat hubungan yang telah tertera di pengesahan anda. The location is 10mins walk from train station, so it might be convenient for travelers who arrive Rome by train, but to other main tourist spots takes at least 15mins walk and above. The room was cleaned very decently everyday, I think the cleaning man work very hard. But the hostel has some not-so-good-condition itself. The door lock of the room is loosen, the toilet lid is completely broken/ dislocated which will make u fall into the toilet if not carefully seated. Had mention this problem to the host, but the reply was "oh its ok, not your problem." We thought the reply should be" will be fixed of u?" Wifi not that stable as well, disconnected often, so not recommend to those who need internet a lot. Very nice, clean and comfortable rooms. We got everything we needed and had all the privacy we were looking for. The owner is super nice and helpful, everything is well organized and the location is superb. Atmosphere, relation to clients, room. A very nice family hotel with a pleasant atmosphere. Friendly cleaner. Good location. Lovely place. This is my second time to be in Rome. I would highly recommend this to all of the traveller. The room is exactly the same as in the picture. It is about 10 mins walk from termini. However it is acceptable and it is about 15 mins walk to the colosseum. You may find a bit inconvinient at the first time of arrival. Because you actually have to call the person in charge to get you access. Other than that everything is perfect. We liked to be there. The staff were very flexible and helpful, the room was absolutely clear, well-smelled and calm (thanks for the windows) and the breakfast was delicious and sufficient. It is great that we had an own bathroom and fridge in our room. The only thing what is negative is the surrounding: there are many vendors on the streets - as in Rome everywhere. :( Summarized: I can only offer to you this hotel! Nothing was good about this hotel, terrible everything. Terrible place to stay. I strongly advise finding a different place to stay. I naively thought I would stay here due to its proximity to the train station. Honestly, it's worth staying somewhere a bit nicer (location wise) and getting an earlier taxi or whatever. There is no value to this hotel. The staff are hopeless, rude and completely apathetic. The seedy element outside the hotel would put most travelers off and kill any semblance of a romantic vibe. The hotels around the area are ok, mostly crummy tourist ones though. Don't stay here, it's not worth it for any reason. the room is clean, not that small than what I had in mind, it is not a hotel but a guesthouse so we didn't expect that much, the apartment itself is very peaceful. Aside from what I have mentioned above, the location of the apartment/guesthouse is a bit of a challenge. Guests need to go through 3 doors before you can find and enter the guesthouse. The 4th one would be the room. So the guests would have 4 keys just to get in their room. If guests are to go out for a night sightseeing, it would be a bit scarier because the footpath that you walkthrough on your way back to the guesthouse from the Metro is a bit dim... not well-lighted and almost no other people in the area that you can see… like a scene in horror movies.. But if you are in a large group then it would not be a problem. Piacevole. Unica pecca, non c'è l'aria condizionata in camera. A szállás közel van a Terminihez, a metrómegálló a téren van. Minden jól megközelíthető még gyalog is. Nagyon jól éreztük magunkat, a személyzet nagyon segítőkész, a szobák barátságosak és minden nap volt takarítás.